The Best Wilderness Survival Kit for you, is the one you build, for yourself. It must be practical, light-weight and compact, and all its components must be multi-purpose and multi-functional. There is no purpose and no point in building a kit that does not make the trip with you. This is why it must be compact, easy to carry, and practical. Your Survival kit should be an awesome package that you never want to be without! These tools must be of the best quality that you can afford. You will have to depend on them, … to save your life.! I am including these 10 essentials, in this all-encompassing and complete, wilderness survival kit. I have built it from a lifetime of backcountry experience, in the Boreal Forest. It can perform anywhere, on this planet! … and this is a great place for you to begin. In my opinion, your Fire-Starter holds an elite position in the Best Wilderness Survival Kit for you. Fire is one of man’s greatest inventions. We hear this expression often, however, man did not invent fire. Fire is a natural phenomenon and we learned to build fires, by harnessing natural fires. Later we learned how to control fire and how to use it to our advantage. Your ability to build a fire is at the very top of the Survival Skills you need to master. 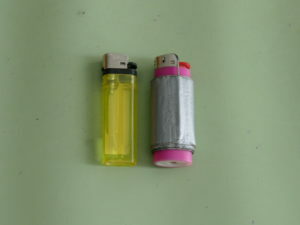 2 Bic-Lighters, the (see-through) models, so that you know how much fuel is left in the lighter. A Ferrocerium Rod, a Magnesium Striker, Waterproof Matches, and a Tesla Lighter are other options that you can explore later on as you gain more wilderness experience and decide to include more hi-tech tools. Packaged tinder and fire-cubes are inexpensive items to include from the very beginning. The knife and the firestarter are the two most powerful and practical tools in your kit. It is a must-have for your kit. I recommend carrying 2 knives and a sharpening stone. A blade as thick as you can afford and a full tang. This tool can do many things to benefit your situation. It can be used to build your shelter and get your fire started. Learn about what makes a good knife before you go out and waste a lot of your hard-earned money on a “Rambo” knife that will scare your dog and cat. You don’t need big expensive knives to build a shelter, start a fire, or cut a piece of your favourite cheese. Wait until you learn about blades and steel before you invest in your killer blade. The shelter is another high priority on my list. In my neck of the woods, from 49°N latitude to 60°N Latitude, heat is seldom an issue. Rain and cold, are always the big killers here. This is why I place a lot of emphasis on the ability to build a shelter. I construct my shelter in a way that I can build my fire inside it. This is easily achieved once you learn how it’s done. Until you can use the tools, and until you acquire the skills to do so, I recommend you purchase an emergency shelter. This shelter sets up quickly and solves this problem for you. Be vigilant and self-aware. Do not wait until your fingers are numb, and your feet are cold, to do something about it. 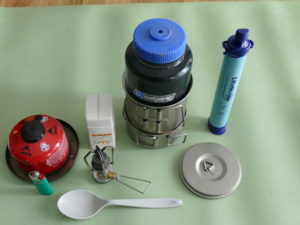 A plastic water bottle is fine to bring along, but a metal pot can boil water to purify it and make hot beverages to bring your core temperature up quickly when you are on the edge of hypothermia. Some hard-core types bring only a metal bottle, usually made of stainless steel. I agree in part with this theory, but I have improved on this idea, by carrying a Nalgene bottle, nestled into a SnowPeak titanium pot. The water bottle fits perfectly into the pot and that gives me a 2-litre capacity for holding water. Since one bottle fits into the other, it does not create any increase in volume for my 25-litre daypack that carries all my wilderness survival kit. Another set up that I have carried in the past, and still have at home is a US Army canteen nestled into a stainless steel cup. This is a real winner for me as well, … army strong, … and bombproof! I prefer “see-through” water bottles, that I can see what the inside looks like after I’ve cleaned it. There are “clear” army canteen bottles now that make this an excellent option when paired with a stainless steel cup. Another benefit of “wide-neck” Nalgene bottles is that they attach to pump-style water filters. My first 4 items will get you undercover, sitting by the fire, and drinking a hot beverage. If you have coffee, hot chocolate drinks, or tea, in your kit, bonus points for you. If you have none of these, don’t panic. The hot water will make an excellent drink that will keep you warm and comfortable. A headlamp is another high priority tool. I recently purchased a 2-headlamp package from a big-box store for less than 20 USD, 6 coppertop batteries included. 300 lumens of brightness, I carry two headlamps in my daypack. I’m a big fan of having a backup whenever possible. Murphy’s Law is never far away, and if you carry only 1 headlamp, rest assured that when you need it, it may not work. Same applies for knives and firestarters. A quality flashlight makes a good backup, but I lean towards headlamps because they leave my hands free to do other things. Lumens and Quality are the things to consider here. Do not forget your batteries. One set of fully-charged batteries, in each unit and an extra set, to seal the deal. Same for the Flashlight, if you decide to use one as your backup. 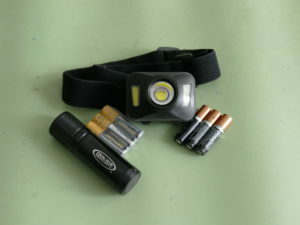 I make sure that my headlamps and flashlights use the same type of batteries so that they can be interchanged. A convenient and practical group to have at your disposal. They can be used to build your shelter, especially the rope. The duct tape will patch small holes in your tarp, piece of plastic, or other commercially available shelters. Duct Tapes has hundreds of uses, and a full roll weighs only ounces. Snare wire can be used to build snares to capture game. This is more for extended stays and skilled woodsmen. Paracord and construction-grade string line are 2 useful examples. Name Brands and types will vary with the areas you live in. 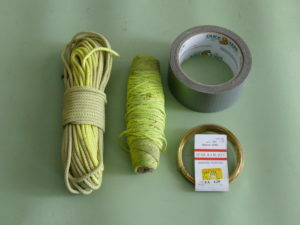 Snare wire, Re-bar wire, and Duct tape can be used to repair many things. A full roll of good quality Duct tape is not very heavy, and more than you will need. 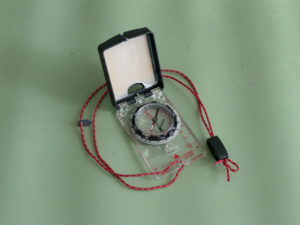 The Compass is another essential tool to have in your kit. A professional grade compass is the goal here. Map and Compass, by Cliff Jacobson, is one of the best, illustrated guides on the market. It will help you understand the map and compass. A topographic map of your area is the “frosting on the cake”. The compass needle does not point north. The compass needle ” lines up” with the Earth’s magnetic field, … to magnetic north, … and not true north. This angular difference is called declination. In addition to this, the magnetic pole is always changing and as a result, the declination value will vary from year to year, and from place to place. Cliff Jacobson’s excellent, illustrated guide contains about 80 pages to describe the proper use of a topographic map and an orienteering compass. I suggest that you purchase this book at the same time as you purchase your “orienteering” compass. Be sure that your new compass has “adjustable” declination. One litre of water and a variety of packaged snacks is the minimum. Here I focus on high food value and weight. There are too many items in this category to mention them all, but protein bars, chocolate, dried meats, sardines, cheeses, packaged oatmeal, “just-add-water” noodles, and dehydrated meals should constitute the basics here. You know what you like. If my options are not for your menu, carry foods that you prefer and are available in your area. The qualifier here is packaged and shelf-life. Rotate them often and when you use them, replace them. These foods can be used on a day to day basis, and by doing so you’ll find out what you like, and what you don’t like that much. When you haven’t eaten for 2 or 3 days, you’ll be a lot less fussy! You can survive for 3 weeks without food, but only 3 days without water. Focus more on water and you’ll be fine. I always carry a LifeStraw water filter. It weighs only 2.2 ounces, 64 grams, and is worth its weight in gold! A small compact First Aid kit. 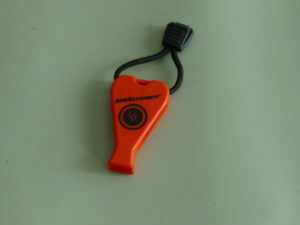 The St. John Ambulance website is the best place to begin your research on this necessary component for your kit. There are many versions on the market, but don’t waste your money, and jeopardize your health and safety, with cheap imitations. You don’t need to carry a “hospital” on your back, and this is why looking up the St. John Ambulance website is time well spent. This is also the section to include any personal medications that apply to you. Be aware and take your time, … and hopefully, you can leave this kit in your daypack. This is a small pouch of “extras” that are useful, practical to have, and worth carrying. So to wrap things up, … this is the minimum, that you should carry. All of these items weigh only a few pounds depending on the models and name brands you choose. Start here, … and as you gain experience, and add more miles, you will find better quality products, … that weigh less. The outdoors is my go-to sanctuary. It is the place that I escape to when I want to relax and refresh. It is a place of endless beauty and a blessing to all who are fortunate enough to experience it. Life happens, so being educated and prepared increases your survivability factor. Try to research the area beforehand, and if possible get a topographic map of the area. Dress for the season and carry some extra clothing. A tuque, a balaclava, a hat, gloves, mittens, and raingear. All of this can fit into a 25-litre daypack, and save your life. Don’t wait until it’s too late, to build the Best Wilderness Survival Kit that can save your life. If you have any concerns or questions about where and what to purchase, do not hesitate to Contact Me. I really enjoyed reading this article Paul and from reading your “About Me” section I can say that I absolutely love your lifestyle, I absolutely love the outdoors, mountains, forests, rivers, lakes ( being from Ireland we have a lot of nature!) so I can only imagine what a liberating feeling it is to just embark on a survival journey through some of the beautiful landscape. After reading this I hope I stay as motivated as I am now to get up and give it a try, thanks for your great tips, I like how you fit the water bottle in a a metal bottle so you can still boil it AND drink water, it must come with experience, which I can tell that you have lots of it! Thanks, Jack, for reading my post, and for the kind words of encouragement. A few weeks ago, I was watching The Knowledge Network, and they had a “Tour of Ireland” kind of program. I have always read and heard about the “green” of Ireland, but I had never imagined it to be so green and so beautiful. You have an excellent backdrop there for many outdoor adventures. I not sure if I misled you, or if I’m misreading the “nestled bottle” part of my post. I nestle the plastic water bottle into the metal pot “only” for storage and transport, and not to boil the water. The water is poured from the plastic bottle, and into the titanium pot for boiling. Hope to hear about your outdoor excursions soon. Get out there and enjoy Nature. Survival in the mountains is my passion, I was personally trained by my grandparents who lived in a village in the Alps.A true paradise.They taught me which plants, fruit, roots and fungi are edible, how to make animal traps and how to defend themselves from the most dangerous animals in the area such as vipers and bears.I have a question for you, I understand the choice of having an essential survival kit, I would say radical, but I wonder if a satellite phone or a radio could not be useful tools in case of extreme necessity or danger.Thanks for your advice. My answer is yes, absolutely. Technology is leaping forward into the future as we speak. On one of my remote backcountry trips, a few years ago, my friend tried to phone his wife and tell her that we had arrived safely, with his satellite phone. No response for 10 or 15 minutes of trying. He left the phone in the floatplane and later reached his wife with his InReach, which is a device that sends text messages to a phone. While these are very useful, it’s all about connecting to the satellite network. The same story with SmartPhones, if you can connect to a tower, great, but if you are hurt in a canyon or some other location, you’re S.O.L. In the area where I live many people get lost every year, and some, unfortunately, are not found early enough to be saved. They rely on technology, and not on the basic skills that would easily save their lives. Electronics are great as long as the batteries are working and you can connect to a cell phone tower or to the Global Positioning System network. In my opinion, they are a great backup, when they work. The idea behind solid survival skills, like fire building and building a shelter, is that it enables you to survive when all else fails. Hope this helps. Drop by again. These 10 or more essentials are classics. Get the best you can afford and put them in a good daypack. Leave them there and learn fire building, how to build a shelter, first aid, and how to use a map and compass. This is a great start and don’t forget your Duct Tape. It can fix the world. Thanks, bajram, for the kind words. Fire-building and knife work are 2 very important survival skills. 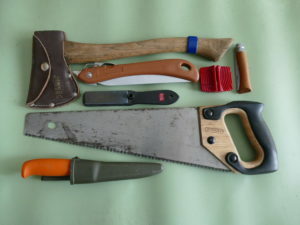 Learn them well and keep these tools with you at all times, when in the wilderness. 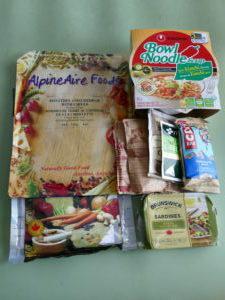 The survival kits you listed here are just the best of all. This is a perfect post and i am glad i read it. Thank you for sharing this insightful article. There is so much to learnI appreciate you providing case studies of your past earnings for evidence of success with this method. I look forward to reading your other articles about growing and having success with outdoortech. I am happy that you enjoyed my post. Outdoortech4u is mostly involved in teaching wilderness skills to young adventurers. It is not a Fortune 500 company yet, but I will forward your request to my accounting firm. When you drop by again to read more of my posts, I may be able to provide you with more details. I do love the outdoors but I am also a little lazy and a little too lady for some extreme camping. On the other hand my husband and my two sons love to go inthe wilderness and explore and you blog is spot on for what they need to know and remember when they go out. I will print your article out and give it to my son. it is a good reminder of what they need to do and I will feel a bit of piece of mind knowing they have followed your advices. Nice of you to forward my post to your adventurous sons and husband. Peace of mind is important for the Lady of the House. Get your sons to shoot me an email, if they would like any assistance in planning their adventures. Always be kind to the Man of the House, so he wants to hurry back from his wilderness adventures. I loved the article. I am one who likes to be prepared and this is a great article to bookmark for easy reference. I think you are spot on about the need to have a survival kit with you. Maybe one in the car and one in the house so you never have to worry about it. I think building your own is the best way to do this. 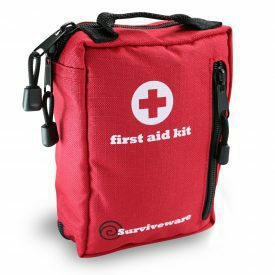 I have looked at buying various survival gear and it always seems there isn’t one that has everything you need or comes with more than what you would be able to carry if need be. I am going to bookmark this page. It kept my attention the whole time, was easy to read and follow. Good Day, Jeffrey, and thanks. Your are wise to be prepared. Survival kits for your car and house are also an excellent idea. Simply add or subtract the few items that are less required and add others that pertain to your home or vehicle. No need for a tire-repair kit if you are in the wilderness unless you are on an ATV or mountain bike. A fire extinguisher is a must around the house, and in your vehicle, but not very practical in the wilderness while hiking. Drop by again, and let’s see how your other kits are coming along. This article really came at the right time. I have been thinking of having an outdoor experience to maybe a wilderness and I do not really how to go about it and the materials I need to do it but reading this article I have seen the things I really need . Thanks for sharing this information. Thank you, Lok Which, and drop by any time. I’m happy to share this information with you.